Wine country is pretty much adult Disneyland, don't you think? You are surrounded by so many great vineyards creating amazing wines, and also surrounded by lots and lots of good food. A few weeks ago my husband and I (and my best friend from high school and her bf) went out to Sonoma and Napa for a long weekend and it was absolutely amazing. Of course, the highlights were all the wonderful wines that we had. But when it comes to food, hands down our favorite meal was at Thomas Keller's Ad Hoc. I had very high expectations going into the meal, and they were all met or exceeded. One of the more interesting dishes of the night was the cheese plate that came out right before dessert. On it were a few homemade crackers, a delicious local goat cheese, and a pear sauce. At first, we didn't really know what to do with the pear sauce, other than putting it on the cracker, but it turned out to be amazing. The pear sauce on its own was heavenly, and it perfectly complimented the goat cheese. Of all the wonderful things we had to eat that night, it was the pear sauce that we kept talking about. My friend and I convinced ourselves that we needed to try to make it when we got home. Well, looks like I got to it first, Michelle. :) Because I was making this a little bling, and just going off of what I knew about making apple sauce, I decided to use a couple different types of pears. If you can get your hands on more than one variety of pear, use them all! However, if you just like one type of pear, by all means, just use that one. I just felt like Thomas Keller wouldn't just use one type of pear. To get your pears ready to be pureed, peel and core the pears, then cut them into 1-inch chunks. Add them to a big pot with some water, lemon juice, and a few spices. Bring the pot to a boil and let cook, covered for about 30 minutes. The pears should be nice and soft. Then use an immersion blender or a normal blender (just be careful) to blend the pears to a nice smooth puree. And that's all it takes to make some fantastic pear sauce. 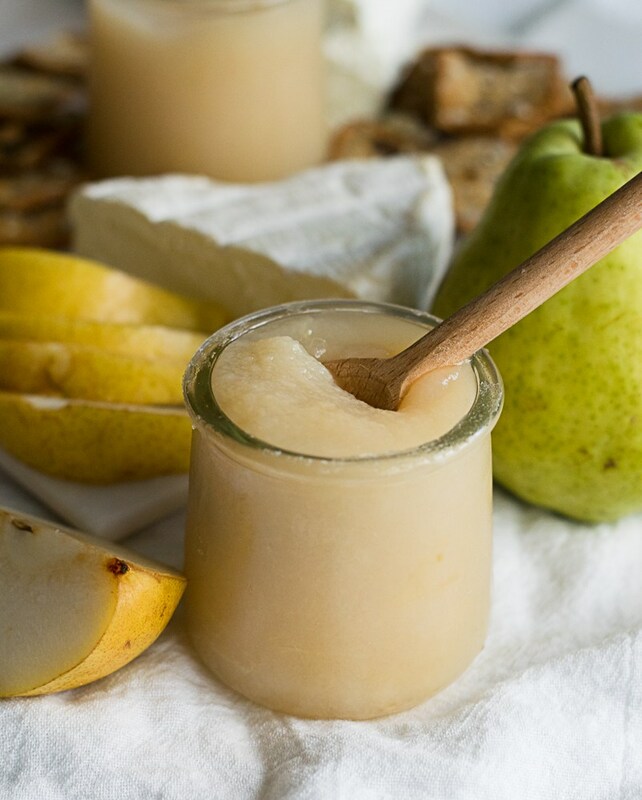 Yes, it's just like applesauce, but made with pears. And let me tell you, it's delicious with cheese! Of course, you can just eat this on its own. I ate most of the pear sauce right out of the jar with a spoon for a delicious treat. But let me tell you how to really class up this simple little sauce - throw it on top of a cracker with some cheese. Serve it to your friends and they will think you are just so sophisticated making homemade pear sauce and serving it on a cheese board. But we all know it's actually pretty easy. And delicious. I mean, if you can't trust Thomas Keller to tell you what's delicious, who can you trust? In a large stock pot, add all the ingredients. Place on the stove over medium-high heat. Bring to a boil, then reduce heat to medium, cover, and cook for about 30 minutes or until the pears are soft and easily pricked with a fork. Use an immersion blender or blender to puree the pears into a sauce. If using a standard blender, let the pears cool to room temperature before blending. Pour into jars and store in the friedge until ready to use.